CALLING ALL SEAWOLVES FANS: NOW IS YOUR CHANCE TO “NAME THE GAME”! The athletic departments at Stony Brook and Albany are excited to be playing each other in football every season as new CAA Football opponents. 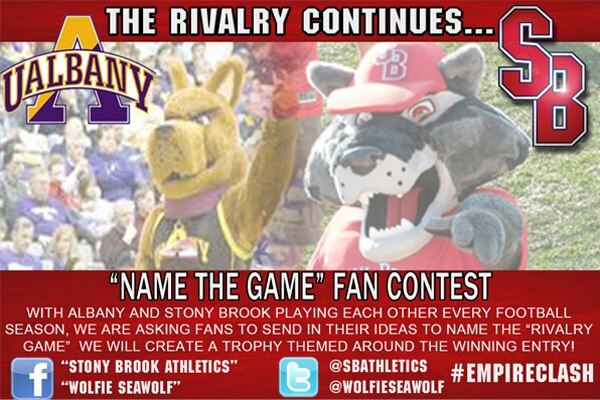 We are calling on all Seawolves and Great Danes fans alike to help us name this newly formed rivalry game. 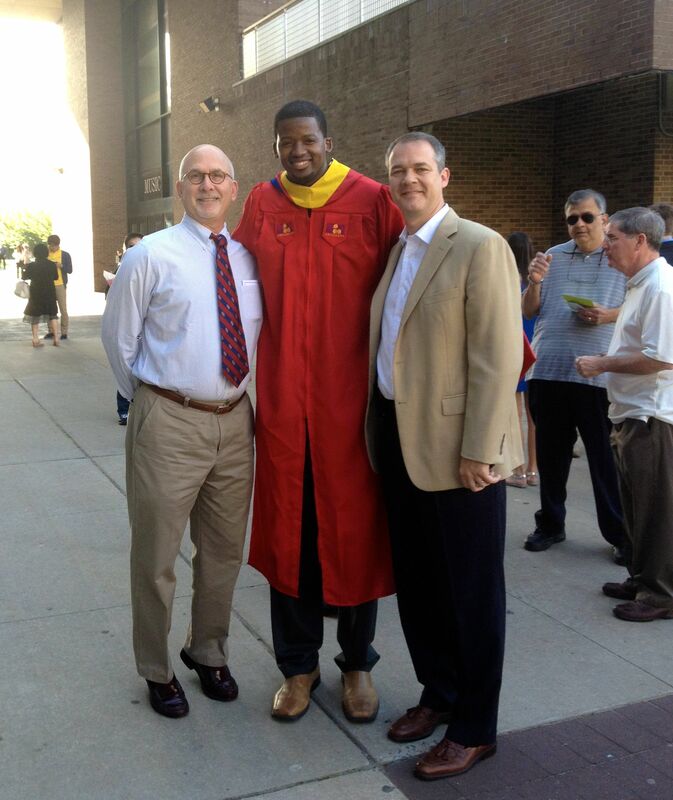 Congratulations on completing your upcoming degree here at Stony Brook, however your journey is just beginning! Become a Seawolf for life! Stony Brook Athletics is excited to offer discounted 2013 Stony Brook Football Season Tickets to all graduating seniors. Much, much more! Special $13 for ’13 season tickets will be available at the Stony Brook Football Spring Game on Sunday, April 28th at 2:00PM. For more information contact Christina Rondeau at 631-632-7933 or at christina.rondeau@stonybrook.edu. Stony Brook, N.Y. – The Stony Brook football team will host Villanova on November 24 in a first-round game at Kenneth P. LaValle Stadium, the Division I Football Championship committee announced on Sunday. The Seawolves (9-2, 5-1 Big South) received one of 10 at-large berths to the 20-team playoff and their first-ever Division I at-large bid in any sport. Saturday’s game is scheduled for 3 p.m. and will be televised live on ESPN3 and the WatchESPN app. Stony Brook tied for the Big South title, its fourth consecutive conference championship, but based on conference road wins, Coastal Carolina received the conference’s automatic bid. The Seawolves have wins over Army and fellow playoff teams Colgate and Coastal Carolina. Villanova (8-3, 6-2 CAA) shared the conference title with New Hampshire, Richmond and Towson, but received the automatic bid based on a tiebreaker. Saturday’s match-up will be the first meeting between the two schools, but not the last. 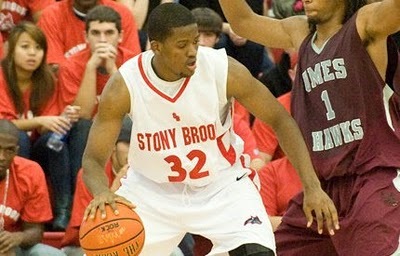 Stony Brook will move to the CAA after this season is complete. The Wildcats won the national championship in 2009. The winner will travel to face No. 3 seed Montana State on December 1. Tickets for Saturday’s game are on sale now. Tickets can be purchased at any time on www.GoSeawolves.org. Reserved chairbacks are $20. General admission seats for adults are $14 and youths and senior citizens are $10. Stony Brook faculty/staff are $10 with ID. The Stony Brook ticket office is open Monday-Wednesday from 9:30 a.m.-7 p.m. and 12 p.m.-5 p.m. on Friday. Offices will be closed on Thanksgiving. Gameday sales will begin at 1:30 p.m. at Gates 2 and 6. For more information, please call (631) 632-WOLF. NOV. 24 AT LAVALLE STADIUM AT 3 P.M. Wish you could watch Stony Brook’s last regular season game Football game? Well, now you can! Raffle Prizes and Giveaways- Courtesy of The Bench Bar and Grill and Stony Brook Athletics. Also, don’t forget to come out to Pritchard Gymnasium this Friday, November 9th at 7pm, for our Women’s Basketball home opener. And on Sunday come see our Men’s team take on Mount Ida in their home opener at 4pm, followed by the Women’s game at 6:30pm. Be sure to celebrate this fun-filled Seawolves weekend with all our your friends and family. Liberty University hope to “Fill The Bill,” as 19,200-seat Williams Stadium is known, for its Big South Conference game against Stony Brook at 3:30 p.m. Saturday in Lynchburg, Va. If the Flames succeed, it will help fund relief efforts for superstorm Sandy. School officials announced that $1 from every ticket sold will be donated to a Virginia-based non-profit called Gleaning for the World, which needs money to transport supplies that already have been gathered to areas affected by Sandy. Obviously, the Seawolves come from one of the areas devastated by Sandy, so, the message from both schools is one of concern for those who were displaced or damaged by the storm. Average attendance this season at Williams Stadium is 16,698 through six home games, and if the Flames (4-5, 3-1 Big South) match that figure, it will put them over 100,000 in season attendance for the first time in school history. As part of the promotion for the game, it will be Military Appreciation Day, and the first 12,000 fans will receive “Thundersticks,” so, it will be a noisy, hostile environment for Stony Brook (9-1, 5-0). Although the Flames have a mediocre overall record thanks to a difficult early-season non-conference schedule, they have an 18-game home winning streak in Big South play. Their last Big South loss was to Gardner-Webb on Oct. 21, 2006. During that span, the Seawolves, who are ranked No. 6 in the Sports Network FCS poll and No. 8 in the Coaches poll, have lost twice. They fell 33-0 in 2008 and 54-28 in 2010. If Stony Brook wins, it clinches the conference’s automatic berth in the FCS playoffs. The Seawolves already are assured of a tie for the league title, but a loss to Liberty would create the possibility of a three-way tie in which the tiebreaker would go to Coastal Carolina or the possibility of a two-way tie with Liberty, which would get the bid based on head-to-head results. So, it’s a classic “win-to-get-in” scenario for SBU at tough Williams Stadium. On the outskirts of Durban is Inanda, a rural village not unlike many villages in South Africa. Although most houses had no running water, electricity or even telephones, Goba viewed his rural upbringing as a positive. “Scarcity of resources taught me to be grateful for what I had; and inspired me to pursue that which I did not have, fearlessly, because I had nothing to lose.”…. Facebook Stony Brook Alumni worldwide and let us know if your local business or home is a game watch location and check-in during the game! Get your RED on! It’s What We Do! Fees: Free admission. Cash bar. for good food, great weather, and lots of fun with old friends. The forecast says sunny skies! You won’t want to miss Long Island’s biggest backyard BBQ with all your BBQ favorites, entertainment from Long Island’s own 94X, and a fun zone for the kids. Register Online before September 20 for a chance to win an Apple iPad. Online registration will close at midnight on 9/20. Additional tickets may be purchased at the door.